HONOLULU (AP) — A U.S. Coast Guard plane from Hawaii and a Navy warship diverted from its journey home searched a remote area in the middle of the Pacific Ocean for a British man many hours after he was reported overboard from a troubled sailboat. The search about 500 miles west of the Midway Atoll, where one British citizen was rescued from the boat and the other went overboard, was expected to continue at least until Monday morning, Coast Guard spokesman Petty Officer Eric J. Chandler said. The 35-year-old missing man was conscious and wearing a yellow life jacket when he went overboard, Chandler said. Officials from the Marine Rescue Coordination Center Falmouth, United Kingdom, reported to the U.S. Coast Guard in Hawaii at about 11:30 p.m. Saturday that one man from the 38-foot vessel had fallen overboard, and the one who remained aboard had little sailing experience. The area nearly 2,000 miles from Oahu was too remote to reach quickly by boat, and winds were reported at 25 mph with 6-foot-high seas. "It's real challenging out there," Chandler said. "We can't get our cutters out there." The Coast Guard sent an HC-130 Hercules airplane from an Oahu air station, and the Navy diverted the USS Peleliu, an amphibious assault ship that was headed homeward, to assist in the search. 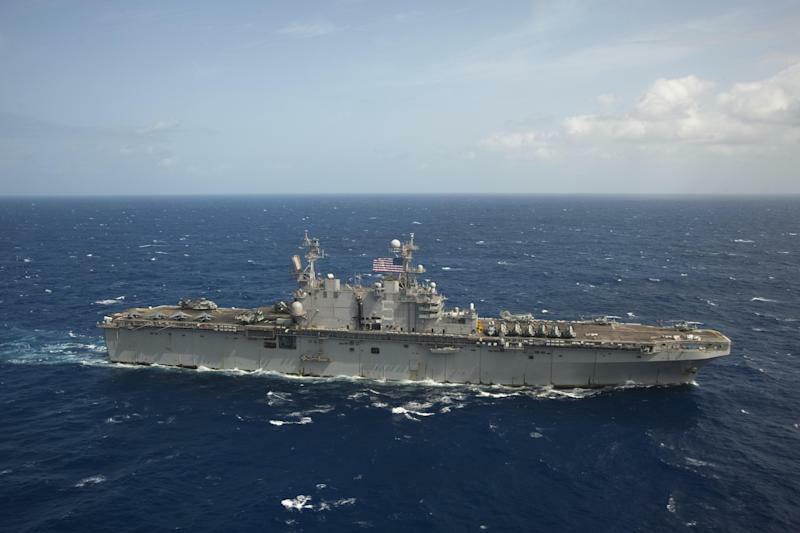 Two Navy helicopters were sent to search from the Peleliu at about 5 a.m. Sunday. One of them found the boat, lowered a hoist and pulled the man in. The Coast Guard plane had two crews working shifts on the HC-130 so one could rest at Wake Island while the other searched. The men's names weren't immediately released and their voyage's purpose was not immediately clear. Chandler said that while remote, the location of the boat was not especially surprising. "People sail pretty often pretty far out of reach," he said. "I don't think that it's that unusual."